1. I got this awesome cycling jersey from Venus de Miles in the mail this week as a thank you for running their blog connector program. I'm working with some lovely Chi-town lady bloggers to help spread the word about this ride, which is July 28. I had a fantastic time last year on this ride and look forward to eating my weight in two-bite brownies again this year. 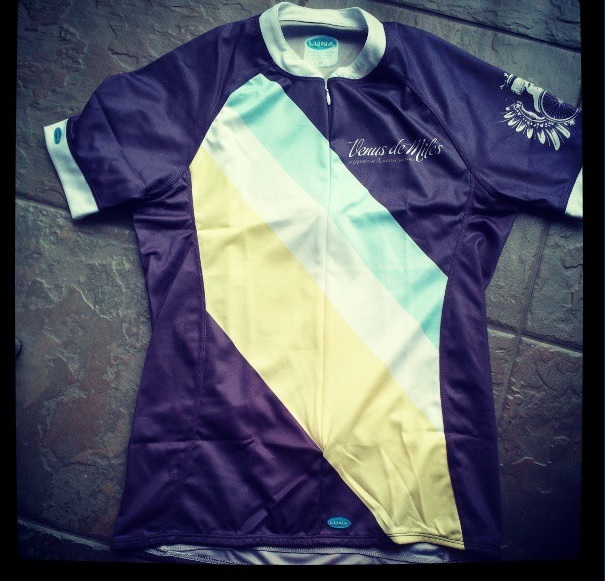 I already checked and this jersey has plenty of pockets for stashing all the Luna bars I intend to swipe at the aid stations. 2. Repeat after me: Free is for me. If you're in the market for socks, I found out that Swiftwick Socks is giving away pairs to Chicago runners. 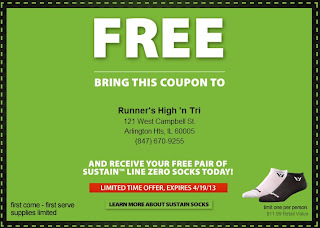 All you have to do is download a coupon and take it to Fleet Feet Sports or Runners High 'n Tri to pick up your pair. Happy feet! 3. 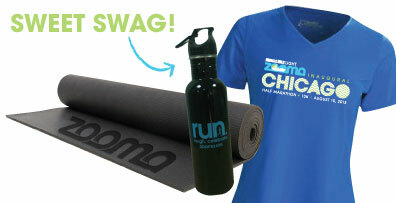 I'm pretty excited that I was selected as an ambassador for Zooma Chicago, which is a ladies-only 10k and half marathon on Aug. 10 along the Lakefront. I ran the Zooma Half Marathon last year in Lake Geneva and loved the post-race party. This race also has some of the best swag in the industry, along with a special medal if you set a new personal record. And since I'm running for bling, this is right up my alley. There's still time to register and you can save 10 percent by using discount code CHIAMB3. do you know if that coupon works at all Fleet Feet? When you download the coupon, it asks you which store you would like to redeem it at. Awesome jersey! It will look so cute on you! I love Luna bars. I just got a bunch on sale at Tarjay today. Ha ha. Very cool that you're a Zooma ambassador!